I'm just throwing these up, so no editing. 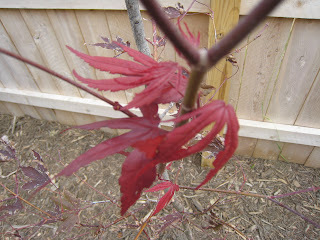 2) The japanese maple is sending out leaves after losing many in the August heat. Hope this doesn't mean it's wasting energy it could use for root growth in a few weeks. 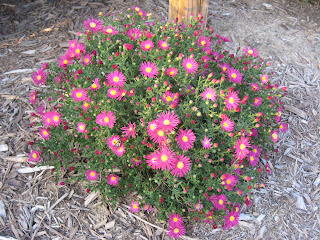 3) Even I think the aster is beginning to look gaudy (but boy, the dozen bees on it the other day don't think so). 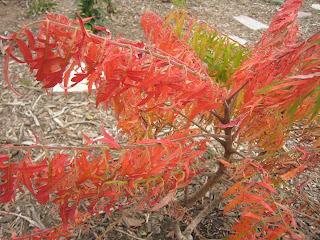 4) Tiger eyes sumac brilliantly orangey-red. I sent out a LARGE batch of writing to literary journals early this month (poems and essays), just after labor day, as every good writer does. Already this month: 7, SEVEN, seven rejections--2 today, Southern Review and Indiana Review. Throw down, throw down journals. That is cold-heartedly fast. It's like they open my sub, read the first word, sneeze, close the SASE and toss it into the outgoing mail. Why do I bother? Seriously? I get nothing out of this pain. Drugs would be more productive. And EVERY year? All year long I do this? I haven't had a piece of writing accepted in a year, and quality pubs don't even ignore me. They do worse. I'm either writing AWFUL like, or am not writing the same crap everyone else writes. Some days I wish I worked in a cubicle doing data entry just to get this wasted life flushed down the toilet faster. Indeed, tis a pitty parade today. Go to someone else's blog would ya? I refuse to change to compact fluorescents. Their light is cold and sterile. It's like I'm sitting back in the orthodontist chair in 8th grade feeling the pain (is child birth like this I wonder? ), the South African laugh of my doctor, the grinding, the girdling, the giddy talk of his aides who clearly take perverse pleasure in their iron works. I swear I'll eat less caramel. I swear. Just stop touching my teeth. I'll stick with halogen bulbs that are warm and inviting. I'll save the earth in other ways (penny pinching for a rain barrel as we speak, and spent extra money on organic fertilizer for the yard). Oh. GARDEN bulbs. Ok. Gotchya. Well, I've been debating how to plant my 150 bulbs from White Flower Farm. I subscribe to the theory that you plant things where you plant them, and let them do whatever they do. Of course, I shop and plan as much as I can for the right plant in the right place since I'm not a certified moron, but I'm just not going to coddle very many plants. Certainly not bulbs. But I've been reading that bulbs don't like wet soil. I have clay. I will have clay for a very long time. 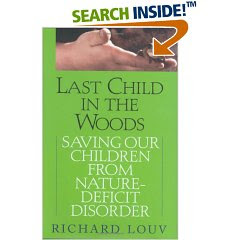 Many websites advocate amending the soil. But for bulbs? I don't have that many resources. Sorry. (I sometimes think all these gardening websites would, if they had their way, amend the ENTIRE PLANET if they could just get enough people on board). Heresy, isn't it? So, if I dig a decent size hole for a bulb--which I won't be doing--and amend the soil for better drainage, won't the water collect in this basin? Won't the clay act as a bowl with this nice new soil inside? I read somewhere that planting the bulb a bit higher than you should might help, especially as they exert energy to come up in the spring. Just hope they don't get heaved out in January. So, I'm going to use my trowel and shovel, dig a wedge, plop a bulb in, and do that 150 times (minus the allium globemasters which are, well, GLOBEmasters). We'll see if I regret not buying a fancy bulb planter. Hey, I did buy bulb fertilizer. And I do own one compact fluorescent (as a reminder to brush my teeth). These are two dfferent topics. I fulfilled my role as a good academic person man, and attended a film and a lecture this evening at UNL. Cronon (who reminds me of that bad guy from that Kevin Costner movie The Postman--what's his name?) had a very interesting, if very long, book project in the works I imagine he won't finish until his last breath. Very extensive, the environmental and social history of Portage, WI. It is interesting how he defines history as environmental / ecological and as social story: history is story. Or, history is part fiction. Meta fiction, I'd venture, Tim O'Brien but with much more fact. Story creates place, and I'll extend it cuz you know where I'm going, creates passion / interest for the preservation of place both culturally and environmentally. Or, let's both place historical markers AND rebuild marshes drained for agriculture. Interesting. Makes me think about a poetry collection / nonfiction book I'd like to write about my Germans from Russia immigrant heritage. Why can't truth be fiction? Isn't truth fiction? If story saves us--spiritually and physically--and it DOES save us--why can't it be false? Oral tradition is myth, right? Myth based on some construed fact? Myth with a moral or ethical imperative? Right? Story gets at us deeper than "this is right, this is wrong." Yes? YES. I told my 101 students this today, and tell ALL my students this. If you gotta lie a little to GET to us, do it. Essayists are coming to kill me. I am a meta nonfictionist. Everyone is, people. And the documentary film tracing some photographer dude who's name I forget in Asia looking at what industrialization is doing to the land and culture, especially in well documented China. Boy. China has problems (duh), and one has to feel bad for them--catching western privilege at a time when our privilege (oil based) is coming to an end. When China's economy faulters due to petroleum byproducts not being made, I fear what'll happen. Wars start this way. I'm just saying. Startling pictures of LOTS of coal, computer parts across the village lands (this is where our computers get "recycled" folks), and thousands of workers in very clean and super organized HUGE HUGE HUGE assembly-line factories wasting their lives. It seems to me. All monochromatic. All homogenized. And yet not. And yet so personally powerful and moving in their dreams et cetera. I wax. On and off. Daniel son. Are we any different? It's just scale--me teaching instead of writing, and them making irons that rotate eerily and ghostly above the factory floor. "Do you like working here?" "I get paid." "Do you feel proud working here?" "It's to help the country as we grow." "Do you like working here?" "I'm sorry, no more questions. Turn the camera off." I've heard of them. I'd seen their products in other gardens. But I've nevered ordered, until now. This is what I need out back. http://www.startribune.com/418/story/1444514.html. Apparently it can lower blood pressure, calm the nerves, ease chronic pain (grad school), help you sleep, and is apparently a religious experience. What exactly is one worshipping or communing with spiritually? Getting dizzy? This just seems too formal for me. This won't be my last entry on his collection of essays, but seeing as I'm in a bad mood today (siding repair man came at 7:30 to hammer away), I need to be absorbed by wit and humor and charm. Wiman has plenty. He's smarter than me, too, or just a good editor. "The soothing sort of verse that fills up our major magazines, with its formal complacency and instant epiphanies (add an anecdote and stir), has nothing to do with serious art." "In contemporary poetry you feel conspicuously one of two things: either the poet is very self-conscious about his means of expression and never lets you forget that, or there's a kind of implicit, self-congratulatory pleasure at not worrying much about the means of expression. In the first instance, you get work that's endlessly coiled into itself, too reflexive to say anything clear about the world. I'm a poem! it screams at you in every line. In the second, you get work that's too slack to say anything memorable about the world. You feel the poet wrote it while eating breakfast; you can almost hear him chewing." Plath: Those sounds coming from the dog underneath our porch that someone had fed meat and shattered glass. All afternoon into the evening, way back in the deep unreachable shadows. Then silence. Ashbery: The infinite absence between two mirrors. Browning: A man who insists on petting a dog in the opposite direction that the dog's fur lies. Milton: One of those people for whom it's impossible to imagine a childhood, or possible only to imagine a very odd one in which even his mother and father called him "Milton." Hardy: A man who has been surprised by life so often that he will not, by god, be surprised by it in art. Pound: An architect who, in the middle of the construction of his ideal design, falls in love with the scaffolding, decides this is what he wanted, this is what he'll keep. Niedecker: A sandpiper, that quick acuity, but in slow motion. I was walking out back on the grass in flip flops or whatever the kids call them these days. When along came a spider. 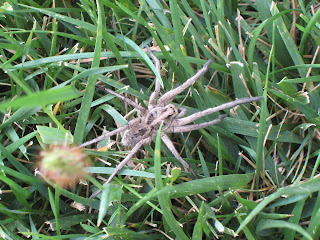 A wolf spider (I do believe--I'm learning). How'd I know there was a spider? It walked across my toes. 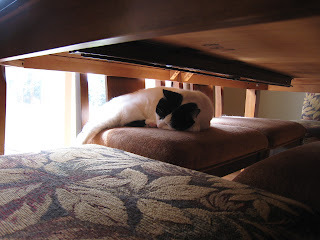 After doing some research, I read (and saw) some nasty images of what their venom can do to your skin, and what they can do to cats who sneak outside behind you (so thankful the cat went the other direction as me). After finishing my photo shoot from a moderate distance, I backed into ANOTHER wolf. At which point I felt outmatched and outwitted so I jumped my way inside. 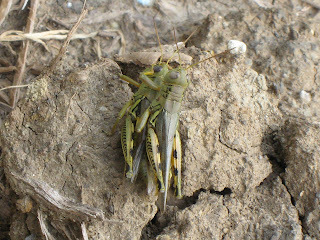 And in other news, grasshoppers were giving each other piggyback rides. 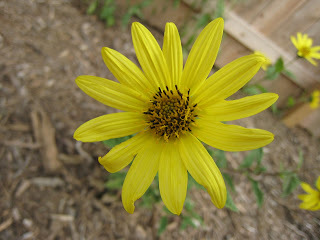 And further down, I'm thrilled to have Helianthus Lemon Queen to brighten my Septembers from now on. I planted over 100 dealioes in July and August--hardly prime time, I know. Still, I expect more. I'm left with hope only (darn gardening gene). 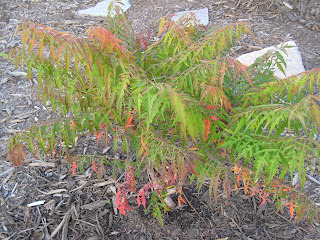 The Tiger Eyes sumac I purchased a few weeks back wasn't yellow--I figured it was because the nursery had it in an area that received part sun. It hasn't yellowed here, instead, it's embracing fall (sure, with brilliant red and orange, but this depresses me). The geranium. Yesterday, it's got leaves. Today--can you see any? Rabbits? At least the aster and plumbago took. But it might as well be winter. I need next spring now! I need full garden year #1. Note to anyone reading--Blogger blows! How can I edit my text like I could a week ago so it doesn't appear stupid like? I've spent an hour pissed off. Because though this is my first year with a full-fledged garden of my own, my other smaller plots and history working FOR my mother show me things are seriously STRANGE. Especially this year in NE, where flowering trees started blooming, froze, and bloomed nevermore. And frankly, I don't remember a summer where it gets to 100, is so muggy so often, and one month is bone dry, and the next you swear you'll see Noah steering his boat down the street screaming "hop on, y'all, quick like." This evening before sunset a large flock of gulls (I think, something like that) descended on the neighborhood. 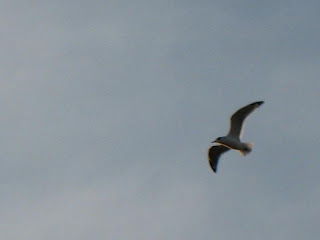 In the strong SE wind they'd turn long corners, glide, then pump back to start their circles again diving and swooping. 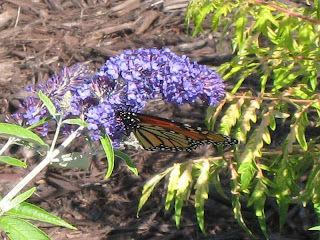 Were they gorging on monarchs migrating above? 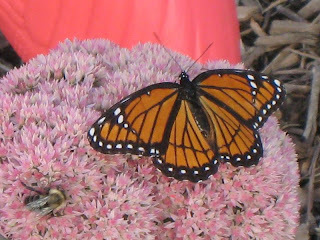 Monarchs were gorging on my matrona sedum, three at a time. 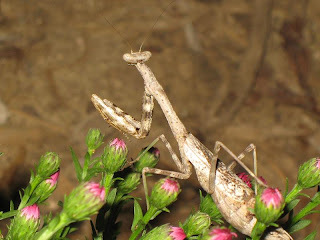 The preying mantis had just finished off an orange caterpillar on the hardy aster: one segment was left--alas, no pic of that. 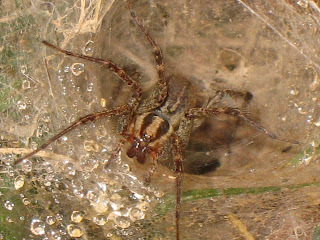 It was washing one of its claws. Then it ran about 80mph away on the ground. Fast buggers. My yard received 2" of rain recently. This is too much. It rained, hardly thundered. Things are inundated. Mulch has floated away. The point is, I am not happy right now. In order to assuage this unhappiness (due to apathy toward my book writing and learning and student grading) I've decided to make fun of the annoying weather person on a certain local news channel (ABC 8, Lincoln, NE). This woman says THUNDERSHTORMS. Drives me freaking INSANE. It's not because I speak so well myself, but if you speak to thousands, tens of thousands of people at one time, you better pronounce key terminology correctly. She also chokes frequently on her own words, so hurried she is to say that today was 75 and tomorrow should be warmer. She just ain't natural, and it hurts me to watch. But I do. Because I have to pick at something and I'm out of snot and zits and moles and scabs. In other news, ever lose your plant i.d. cards on the car ride home? Why not try this: http://www.virtualplanttags.com/. They don't have everything down, and it is mostly the common-er stuff, but for this newer gardener they've helped on a few things. Of course I still have to look at 10 other websites to build a general consensus (turns out my lobelia do love water, oh sure, but not in the winter. GREAT. I ain't moving them. We'll see what happens. Curses. Curses.). I hate that weather person. ThunderSHtorms. Sheesh. 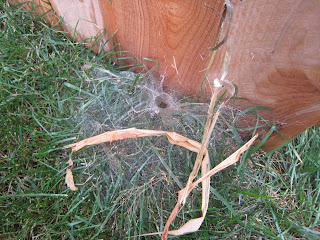 The joys of a bigger yard: spiders (and way too many grasshoppers they don't seem to catch). 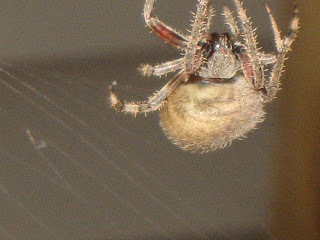 Never seen this before, but it's a relative of the wolf spider. 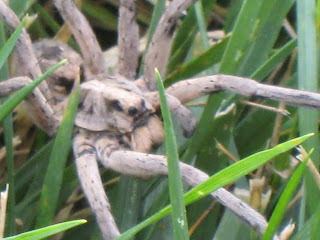 It came out of its funnel to greet me, until I blew on it, and it went deep in, under the grass. "I consider not being able to write as a manifestation of grace; I think grace sometimes can be anguishing." I have not written a poem in over a year. I have not worked meaningfully on my memoir in over a year (though I am slowly beginning--I do graduate in 2008). The poetry--I've been tired, I've been disenchanted, I've been crying in the peaceful silence that is, almost always, an immense blessing down the road, but is agonizingly so. The agony of not producing / living what so deeply drives your soul and existence is something I can't describe fully at this point in my life, but reading of Wiman's experiences in his first collection of essays gives me immense hope, immense confidence, and helps me see that my long periods of depressed constipation are necessary, beautiful moments of my evolution as a writer. Wiman's first collection of poetry was on my comp list a year ago. I marveled at his blank verse, a form that has come to define my own work and way of seeing the world via language. I've not picked up his second collection, but will. I just received his prose, Ambition and Survival: On Becoming a Poet, because right now prose carries more promise and joy for me, and because the title--perhaps--hinted at getting me back to being a dualistic writer. I write the best when I have both poetry and prose nipping feverishly at my feet. (I have a terrific idea for a new book of poems--which needs much research--but I cannot possibly begin work until the research and writing for the memoir is done). Anywho, this is becoming a personal review on a book I've only read 1/4 of. I had no idea Wiman is suffering from a rare and mostly unknown type of cancer in his blood. An article in Poets and Writers led me to pick up my newly purchased book with fervor this afternoon. A confession--I consider myself a Christian (why must I feel guilty for that? Because I work in the liberal bastion of higher ed? I am middle of the road thank you very much). I don't go to church, I will someday again I have no doubt, but God isn't so much in buildings as he/she is in everything else (see Wiman below). So it's interesting to me to find Wiman talking about how periods of absence in his own productivity were periods of gathering faith--in literature, self, world, and God--and how this led him to a more spiritual relation to his work, and the belief that such kinds of substance in postmodern writing is severely lacking and even hurts poetry's readership (And faith--avant garde poets have no faith in language or what faith causes it to come forth--"You can sense the staleness and futility of an art that seeks energy in gestures and language that are, in the artist's life, inert. It feels like a failure of imagination, a shortcut to a transcendence that he either doesn't really buy, or has not earned in his work."). I've alienated many people I enjoy talking to. "Art is like Christianity in this way: at its greatest, it can give you access to the deepest suffering you imagine--not necessarily dramatic suffering, not necessarily physical suffering, but the suffering that is in your nature, the suffering of which you must be conscious to fulfill your nature--and at the same time provide a peace that is equal to that suffering. The peace is not in place of the sorrow, the sorrow does not go away. But there is a moment of counterbalance between them that is both absolute tension and absolute stillness. The tension is time. The stillness is eternity. With art, this peace is passing and always inadequate. But there are times when the very splendid insufficiency of art--its "sumptuous Destitution Without a Name," in Dickinson's phrase--can point a person toward the peace that passeth understanding: Herbert, Robinson, Eliot...."
"I think most writers live at some strange adjacency to experience, that they feel life most intensely in their recreation of it." And oh how this is me at this point. If I write, I live fully. If I don't, I might as well be ashes. And my eco ears perked up here: "I was brought up with the poisonous notion that you had to renounce love of the earth in order to receive the love of God. My experience has been just the opposite: a love of the earth and existence so overflowing that it implied, or included, or even absolutely demanded, God." I've longed to be published in Poetry, the prestigious journal he edits. But now I think I'd like to be published in it for other, more substantial reasons. 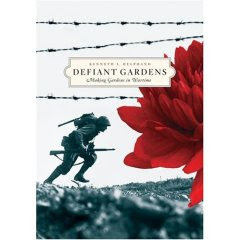 I see connections here to the stuff I'm reading about Jews gardening in the Warsaw ghetto, POWs gardening in forced labor camps in Japan, and anticipate more of in a thick anthology This Sacred Earth: Religion, Nature, Environment. Namely, there's something up with connections between art, religion, and the earth that is new and vital, that might save us from something horrible if we stop to really feel the suffering and the peace together, instead of separate. 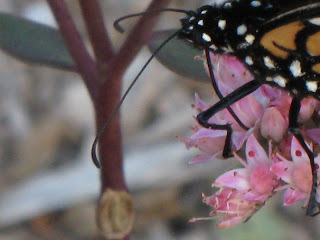 I think in gardening and writing--here goes my thesis--there is a moment of peace in the midst of suffering; suffering that is large and real, or small and imagined. In the act of experiencing life, and for a writer that might mean writing vs. "living" it (just as for a painter it's painting), we suffer peace. Poetry is 50% absence. All great art is this. I think our lives are this, too. While writing--as with gardening--I feel an occupying absence (I think this is God, or you can go with muse if you'd like). I used to fear it and tried to ignore it, I used to want to fill it to banish it, I used to think something was wrong with me for knowing and identifying it. Now I think I'm beginning to understand that the ground rules for living a passion aren't so much the stuff of real substance as they are momentary tributaries into being more fully human. And other. The substance of absence? 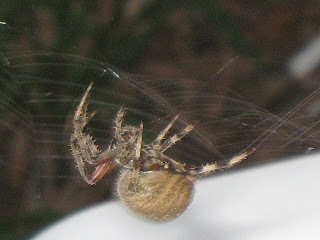 of those big yellow and black garden spiders with the lightening bolt web design (which confuses its prey I hear), but they're harmless. Is this? It's right by the gate. And in other news it's White Flower Farm bulb time; I'm a bulb virgin, and indeed a WFF virgin. I hope my first time is... oh for pete's sake just stop it. How old are you anyway? 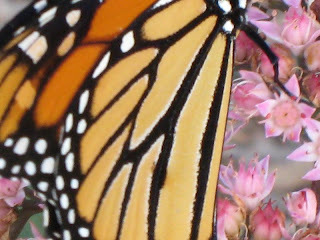 So apparently right now in NE if you use binoculars you can see migrating monarchs against the clouds. We'll see. Anyone else giving the bird to the majority of these? In the good old days, say 2-3 years ago, $10 got you 3-5 poems or a medium length piece of prose. These days, it's $15 or more (a few have the nerve to go $20 +, for THREE FREAKING POEMS. Oh, but you get a free book or journal copy. Woohoo.). $20 got your book-length mansucript in the door, too. Now it's $25-$30. What suckers are entering all these contests? Who can afford it? You have to be OVER selective, if that's possible. 1) Pick only those places you believe you have a realistic chance (ha) of sparking interest with; 2) pick a very few prestigious ones you just HAVE to enter; and 3) send only the best best best work that's been simmering on low heat for years, but that's also sparked someone else's interest. My cutoff is $10 for 3+ poems or an essay, and $20 for any book manuscript. I hope some of these places feel the pinch soon, but with so many writers--and let's face it so many novice writers--it ain't likely. And please don't talk to me about it being supportive of the arts--I strongly believe in curing cancer and having gender equality and saving the rain forests, but I don't go in debt over it. I'm shifting more focus to regular submissions--90/10, no more 75/25. Here it is. Picked this up at Ambergate. It's from Korea. 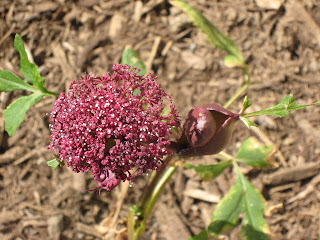 It grows 5-6 feet high, and is reported to self seed nicely, though I'm sure I'll help it along once it goes to seed. It's a biennial. Its flowers look glittery. I want a colony. I know it doesn't "go" with the native NE plants I got going almost everywhere else in my 2 month old garden, but it looks nice across from the sun-scalded red Japanese maple and the isanti dogwood. Too bad the electric meter is just three feet away. 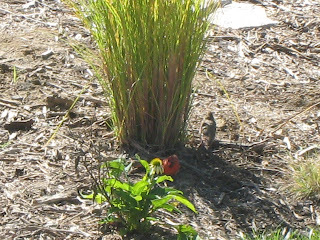 In other news, the cardinal brought his lover in to check out the maiden grass. I can hear them in the cedars as I type. In other news, had a lovely rejection note from MO Review. I always get lovely notes from them, just never anything truly loved. 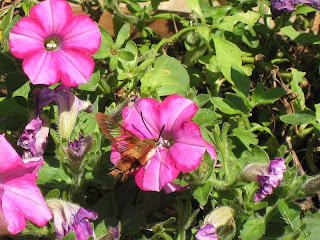 This time I sent them a small essay on hummingbirds and my grandmother--a darn good piece and one I'm particularly fond of in my memoir--and they said they liked it a lot, but felt it was disjointed in spots (I disagree, but I might look at it again later this fall once the book's first draft is all down). Good thing it's sim-ed out to other places. I've hope. Until it's dashed again. Like most every fall. I really want to be in MO Review. One is Linda Hogan's Dwellings: A Spiritual History of the Living World. I'm not going to go into all that crap about me being a white male and in some way appropriating some Native American culture or religion, because frankly, that's not Hogan's fear. Her fear is no one will listen or be changed by her words--any writer's fear. 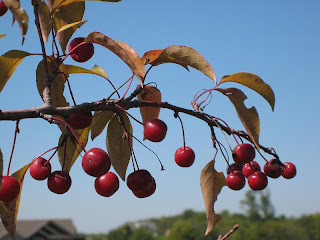 Hogan discusses in the essay "A Different Yield" how we need a new language to more deeply get ourselves, the earth, all the others, and the connection of all three. This is the language I see many prose writers--creative nonfiction folks especially--looking for in their work the last few years. Let's face it, if you aren't moved emotionally / spiritually in a piece of writing (on whatever level works to do that--sound or sense, as in poetry), then the writing fails. The art fails. The communication and life fails. "We have feelings that can't be spoken. That very speechlessness results in poets that try to articulate what can't be said directly, in paintings that bypass the intellectual boundaries [hurrah!] of our daily vision, and in music that goes straight to the body. And there is a deep-moving underground language in us. 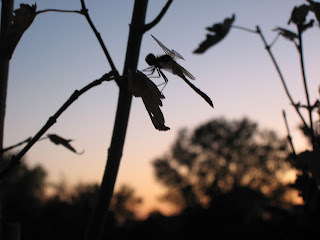 Its currents pass between us and the rest of nature [....] What we really are searching for is a language that heals this relationship [human and animal /earth], one that takes the side of the amazing and fragile life on our life-giving earth. A language that knows the corn, and the one that corn knows, a language that takes hold of the mystery of what's around us and offers it back to us, full of awe and wonder. It is a language of creation, of divine fire, a language that goes beyond the strict borders of scientific inquiry and right into the heart of the mystery itself." "I know this telling is the first part of the ceremony, my part in it. It is story, really, that finds its way into language, and story is at the very crux of healing, at the heart of every ceremony and ritual in older America." I know she's talking about the oral tradition, but folks like N. Scott Momaday advocate bringing the tradition, healing the rift, of oral into written--to take what's been dominate and subversive and make it subversive right back; this is what so many "minority" poets do when they right in received forms. Writing, speaking, thinking to one's self is all an act of faith and communicating that faith--faith in ourselves, the person next to us, and that everything we sense is equally part of the world. Inclulding us. Equal. Essential. Purposeful. "There is no real aloneness. There is solitude and the nurturing silence that is relationship with ourselves, but even then we are part of something larger." When I am sitting silently anywhere, I am overwhelmed. When I am writing, I am more overwhelmed to get everything out that's talking to me, and I often simply overload. And when the phone rings, or a spoon drops, or a truck drives by, I am brought back into an incorrect relation with the world around me. I am broken from myself like a branch in some storm. I'm humpty dumpty. As in poetry, as in all writing, silence is at least 50% of the language, if not far more. Without silence, there is no sound. Without darkness there is no light. 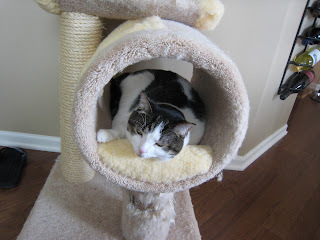 Without this blog there is no work getting done. I love fall. It is my favorite season and is always too short. Spring is next. Winter not far behind. And then summer. Still, I am not ready for fall. Today's dark grey, light rain in the mid 50s has left me feeling weary, heavy, achey, somber, and oddly warm (could be the long sleeve shirt, or my ABD laziness). And yet it is the perfect day for those things in life whose bright light is so small they stand out starkly and richly from the world. I am talking about glances, touches, sighs, the sensation of new socks. I am talking about cardinals and sunflowers, both of which seem to appear instantaneously out of thin air this time of year. 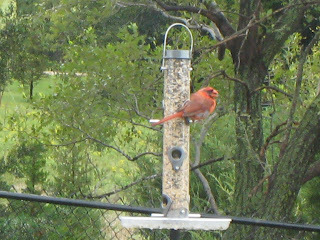 The cardinal has been chasing its mate around the yard the whole afternoon, non stop. 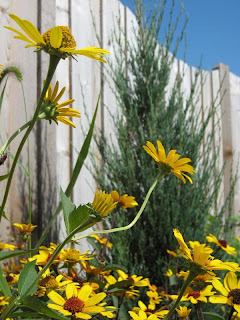 From cedar to fence to feeder to fence to cedar to river birch to grass to fence. I've heard its quick chirps for hours now. 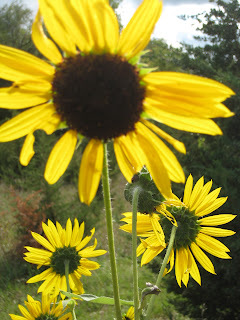 The sunflower kept bowing in the breeze that it was almost as if it was leaning down to me, like some curious giraffe, nosing in to my face then jumping back not sure of either of us in this one place at this one moment. Fleeting. That's what all this is. The sun slides behind the clouds again and the reflected pigments of the world dull. I am hungry for the way mashed potatoes fill the empty spaces inside of me. That's what every website and plant tag should say. Seriously. My lord. You buy a plant, and most people just do what the tag says. My thinking is that's not smart. You don't spend on average of $15 and just follow the tag. You Google it. Everybody should Google (sicko). 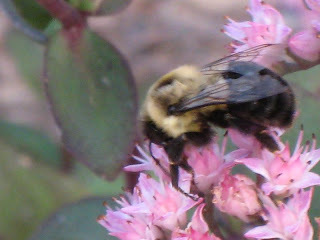 Of course, then you find out that, oh, let's say, you're sedum album coral carpet is a zone 6, no wait, it's a zone 4. Then, well, it's green. No, not really, it's also coral red, but only when it gets cold. But then, wait, also when it gets hot. 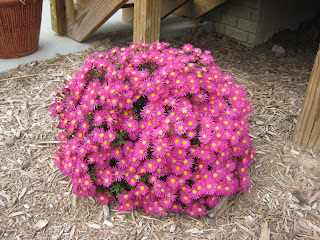 Or, no, when it gets too much water since sedum likes it bone dry 90% of the time. But wait, not just red when stressed, but red in poor soil, like my clay. Wait. Wait. Now it's red ALL the time even though my 36 little multi pack plants are green. WTF. Honestly. This happens with almost everything I research, thinking that if I put the right plant in the right spot I'll have an improved chance of seeing it next April. Does anyone actually grow, engineer, monitor, or in any way OBSERVE over several seasons and with multiple variables what these plants do? Are there ANY standards? "Geeze, look, a new cultivar. Get it out to all the nurseries ASAP and make it cost a few bucks more. What? I don't know how it best grows. Here. Use my wheel of horticulture I spent three years designing. Neat, huh? Lights up and makes noises, too." Sincerely some dork face in a greenhouse lab. 1/2 of global coral gone by 2030. Polar bears gone by 2050. 75% of U.S. and Canada glaciers gone, all gone by 2050. Arctic dumps 10 trillion gallons of water each year, and is 20% less thick than 40 years ago. 1) Blast sulfates into atmosphere to mimic cooling effect of global volcanos: we'd use jet engines, balloons, and artillery. But this wouldn't clean up CO2. 2) Launch 16 trillion refracting discs into orbit to act as sun umbrellas. That's 20 million launches over next 30 years at a cost of $4 trillion. Still have CO2 (not to mention methane). 3) Use large artifical trees to collect CO2 from wind. Each can filter 6.6lbs of CO2 per second. Deal is it's sorta expensive and could leak a lot into ground. 4) Dump iron ore dust into oceans to create large algae blooms to absorb CO2. 1 ton ore dust = 100,000 tons of CO2 gone. Could change sea temps drastically though and kill lots of fish or something. 5) Sequestration methods like pumping CO2 deep into ocean so it freezes and sinks. Or store underground in rock caves. Or pump into coal seams too deep to mine and produce natural gas, theoretically. 6) Plant a crap load of trees. They do it cheap, and they look nifty. 10 = one car's annual pollution, 20 = a big truck's. Hey, free rock. I bet if you went to some nursery or landscape supplier this would cost you a nice lunch. I'd say it's 18x12x10 and weighs about 60lbs. So heavy I coulda barely didna do it, cap'n. 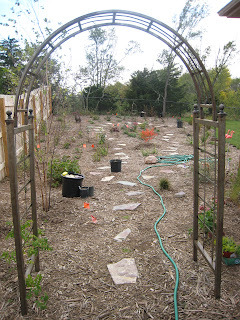 Last weekend, while in MN, visited Ambergate Gardens. I had approximately three Os while there. My dear mother and I figure that they must cater exculsively to landscapers and professional gardeners, because nothing is neat, tidy, or organized. Had a fun talk with the owners--husband and wife team--about NE, the UNL Arboretum, and the nice folks at Finke here in town. Everyone, Finke is the BEST nursery for getting anything different (I bought a Tiger Eyes sumac there yesterday--no one has these this late in the season, but they did, of course). No crap here. 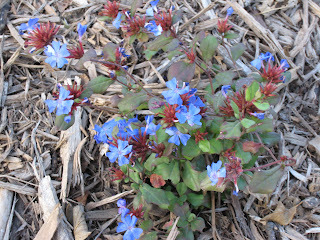 Prices aren't bad, but that's because the perennials tend to be smaller, so patience is required. 1) Finke: unique stuff, always in stock, always good conversation, personable and helpful. 2) Campbells: pricier, but good selection of most everything you'd want to plant these days. Folks on 40th tend to be nicer and more down to earth than those at Pine Lake. Guess there's a reason: Pine Lake is where all the unhappy rich white folks are moving to. 3) Earl May: eh. I prefer the one on Hwy 2--better service. I sometimes find things here, but it's usually just the common stuff. It's Eco, eeeeee-cho. Everytime someone says "echo criticism" I want to whisper in the room, somewhat loud like, "ticism, cism, cism, cism, cism." Anywho, I'm a jerk. Always have been, always will be. Attended the Scott Slovic talk today at UNL. Not too impressed, left early. Not Mr. Slovic's fault, I admire who he is and appreciate--greatly--what he's done, and was THRILLED to have someone like him here, in Nebraska, in front of some fancy new flat screen tv (and yet my office is not air conditioned, where I meet paying customers, er, students). Slovic seems like a very intersting guy if one could talk TO him, and he did reject an essay of mine once so he can't be all bad. But the format was not... good. I could care LESS about what other people in the room are doing or even who they are or what time they read and where they read, particularly when SCOTT SLOVIC is in the room. I want to know what HE'S all about. It made a person want to make a fleet of paper airplanes and let them fly. C'est tout. This is a fantastic book on the idea of nature and culture as symbiotic, and delves into the history of the American land ethic with a tight focus on gardens. Pollan states we have no garden history of our own—it is borrowed and subjugated from other cultures and natures. This is interesting to me. If as a culture we are—or at least once were in some way—a melting pot or salad bowl of some sort, wouldn’t this be a benefit? (Is that a lie?) Why can’t we / don’t we create our own style? Pollan suggests it’s because of those darn Puritans, Thoreau, and various other je ne sais quois (the usual suspects). Point is, the lack of our own distinct garden design ethic is a mirror of our perception of solitude, death, transitivity, and fear of such. Something like that. As I create my own garden I wonder if anything “American” will show its face, or if I am a product not only of my conditioning, but of the nursery industry. Even the fact that I may not live here in four years enforces that transitive nature of my nature. 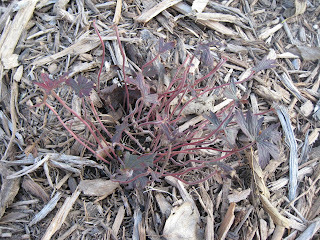 Like the fleeting Angelica Gigas I’ll soon plant, I may be nothing more than an organism on a biennial schedule. 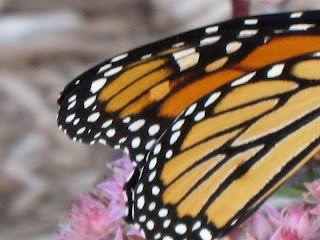 Just by looking at the seed pods--which are jammed with seeds--it's easy to tell this ain't no angel. Leave me alone, it says. Ditto. Labor day weekend was up north, you betchya. Made a bust trip to Ikea (you'd think WANTING to be a good consumer would be enough, but alas, Ikea again did not tempt us enough). Hung a picture. Enjoyed wonderful green beans from a farmstand down the road. Wow. Saw most of the extended family. Got someone to play badminton with me (shuttlec**k). Took some photos of the new(er) homestead (see below). Think I impressed my 17 year old sister with my soccer skills--namely, being able to dodge her kicks that were clocked at 80mph. Got pulled over 1 hour north of Des Moines by an IA trooper for going 76 in a 70--give me a freaking break--but I think he was more worried with the dark tint on my windows (which came with the car from the previous owner); he said they were illegal in IA, but in NE it's ok. So, next time I get to the state line I should acid wash my windows to remove the tint? Then I won't get pulled over? He said he couldn't see our heads from behind. That's the point. And we could've had guns when he walked up to the car and he'd never know. English grad students with firearms? Not until I defend the diss, only then can I party like a true Husker (see annual July 4th display of weaponry as example). We had a nice conversation in his cruiser about where I was this weekend, who was in the car with me (I have NO idea sir, I just picked her up at the truck stop when she bought me a Milky Way), what I did in Lincoln (I said I worked at UNL and left it at that), then I signed his fancy computer screen and got a warning. A ticket would've been $106. They're harsh over their in Costner land. 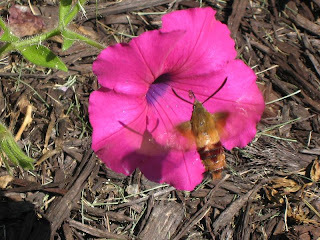 If anyone can tell me what this giant hummingbird-sized moth is I saw up north lemme know.